The human body is a garden of muscles. Think of a garden of plants – for that garden to look good and for the plants to flourish, you need to take very good care of it. Just as you would water your garden, enrich it with soil, fertilise and trim it, the same applies to our body – our garden of muscles. For us to look good and have a better quality of life, we must take very good care of our body. We should feed it nutritionally, exercise regularly, and rid ourselves of anything that is not good for our body. When we do this, we help to cure diseases and have a better quality of life. Exercise because your quality of life depends on it. When we exercise on a regular basis we improve our blood pressure, we sleep better, and we have more energy. We lose weight when we exercise, we build muscles, we get stronger, fitter and live a healthier life. We can run around with our children or grandchildren, we improve our self-esteem, we are better equipped to fight diseases and we get to live longer. I know that when some people think of weightlifting they think of big bulging muscles. I hear this all the time – “I don’t want to lift weights because I don’t want to build big muscles.” That is far from the truth. Unlike some cardiovascular exercises, weightlifting helps us to preserve Muscle Mass. 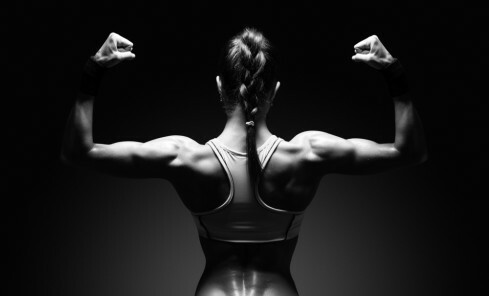 We lose up to about 5% of our muscle mass each decade after the age of 20. Known as Sarcopenia, this process can be slowed down by lifting weights. Weightlifting helps with Weight Loss – when we lift weights we help to improve our Metabolism, and an improved metabolism helps us to burn more calories because the body works harder to maintain muscles than it does with fat. Weightlifting helps to prevent or manage Osteoporosis (a condition causing weak and fragile bones). By lifting weights on a regular basis, we help to increase our bone density, which helps us build stronger bones, hence assisting with managing or minimising the risk of Osteoporosis. Weightlifting can also help to decrease our risk of injuries. When we lift weights, we strengthen our muscles and protect our joints and this helps us to minimise our risk of injuries. Weightlifting is more than just big biceps and squat-booty, so I hope you include some weightlifting in your exercise routine. I sit down with people on a daily basis to discuss their health goals and why it’s important for them to start exercising. I often find that by not exercising, it’s COSTING them something very important, and that something is not money. Sometimes it’s lack of self-esteem due to being overweight, or a horrible sleeping pattern, low energy levels, not being productive at work, or not being able to play with their children. If you have the motivation to exercise on your own, make an investment into a fitness facility that is welcoming and supportive of your fitness goals. If you don’t trust yourself with motivation, my advice would be to invest in a personal trainer who knows what they are doing and can help you achieve your goals. If fitness facilities and personal trainers aren’t your thing, then invest in a pair of runners and go for a walk, jog or run. You need to invest in your health to achieve the result that you want! Your health is not an expense it’s an investment for your future. When you look in the mirror, who do you see? Fitness is not about being better than another person. Fitness is about being better than the person you were yesterday. When you look in the mirror, you are looking at your only competition and you are looking at the most important project you’ll ever work on. Trust me the results will be more than worth it.